Your booking is made with Holiday World Ltd. trading as AmericanSkiClassics.com which is licenced by the Travel Trust Association Number R5735. Flight booknigs are protectec by our ATOL No. T7012. The Travel Trust Association (tel. no. 01483 - 545787) is a trade association of travel agents, tour operators and travel organisers that operate trust accounts, in order to provide financial protection for you, the customer. Any payments you make to us are held in this trust account and are not released until you receive your holiday or your funds are released to another company that provides for your financial protection. Multi-Contract is the term used in the new ATOL Regulations to describe the type of holiday sale where a consumer requests to book a flight with accommodation and/or car hire at the same time or within a day, but where the way in which it is sold means that it is not a package holiday. Multi-Contract has ATOL protection. Flights booked by Holiday World Ltd.
We are licensed by the Civil Aviation Authority and hold ATOL Number T7012. We, or the suppliers identified on your ATOL Certificate, will provide you with the services listed on the ATOL Certificate (or a suitable alternative). In some cases, where neither we nor the supplier are able to do so for reasons of insolvency, an alternative ATOL holder may provide you with the services you have bought or asuitable alternative (at no extra cost to you). You agree to accept that in thosecircumstances the alternative ATOL holder will perform those obligations and you agree to pay any money outstanding to be paid by you under your contract to that alternative ATOL holder. However, you also agree that in some cases it will not be possible to appoint an alternative ATOL holder, in which case you will be entitled to make a claim under the ATOL scheme (or your credit card issuer where applicable). 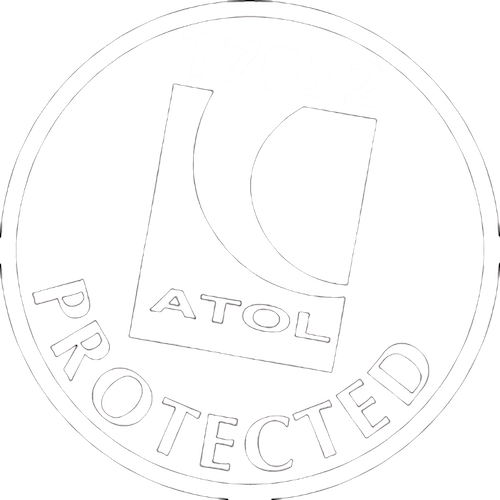 If we, or the suppliers identified on your ATOL certificate, are unable to provide the services listed (or a suitable alternative, through an alternative ATOL holder orotherwise) for reasons of insolvency, the Trustees of the Air Travel Trust may make a payment to (or confer a benefit on) you under the ATOL scheme. You agree that in return for such a payment or benefit you assign absolutely to those Trustees any claims which you have or may have arising out of or relating to the non-provision of the services, including any claim against us, the travel agent (or your credit card issuer where applicable). You also agree that any such claims maybe re-assigned to another body, if that other body has paid sums you have claimed under the ATOL scheme. All payments made by you for ground arrangements including accommodation, car rental, lift passes, ski rental and transfers are held in trust and backed up by the Travel Protection Plan and by a further insurance scheme provided by the Safe Seat PlanInsurance which will reimburse the loss of any amount paid for your holiday up to a maximum of £11,000 per any one passenger. All payments made by cheque should be made payable to 'Holiday World Ltd. Trust Account'. Therefore, the Trust Account plus the Safe Seat Plan insurance coverage will ensure that all the money which you have paid is safely protected and available to pay for those services which you have booked. The payments you make for your flight are held by us [in our trust account] on behalf of the ATOL holder who is supplying your flight, until the date we pass the money to that ATOL holder. Where a flight ticket is paid for in full at the time of booking, a 100% cancellation fee applies so clients booking are required to have travel insurance at the time of booking that offers cover against holiday cancellation. The flights we sell are normally non-changeable, non-transferable, non-reroutable and are subject to the terms and conditions of both the airline and ATOL holder from whom we act as retail agents. All payments made by cheque should be made payable to' Holiday World Ltd. Trust Account'. Where we act as an agent between you and the airline, they may request the payment date is brought forward, in which case we will notify you of this change. This usually occurs when an airline withdraws a fare and request that all tickets at the old fare are issued by a particular date. If you are unable to pay at that time, your booking could be subject to a fare increase or cancellation, whereby normal cancellation fees will apply. Regrettably we cannot accept responsibility for any losses which you may incur in these circumstances. Our flights are provided by scheduled airlines and subject to their terms and conditions of booking. Flights may have to be paid in full at the time of booking and are non-refundable and non-transferable. Any changes required e.g. change of date, after a booking is made are solely dependent on the airline's ticketing and fare policy which we are subject to and have no control over. Please note that if you book your flights many months in advance, the airline may advise a schedule change as they constantly amend their schedules. In this instance, a minor schedule change is defined as less than 12 hours from the original time of departure. Similarly, a change of routing where the flight involves a change of plane is also defined as a minor schedule change so the flight provider has no further responsibility. The airline baggage policy can be either 0 checked bag up to 1 checked bag (up to 23kg) free of charge. A second bag or ski carriage charge is approx. $100 each way. Please check directly with us or your airline for your baggage allowance. Holiday World does not accept any liability for charges made for extra bags or ski equipment. We aim to despatch your travel documents by email approx. 28 days prior to departure. If you have not received your documents or have mislaid them you must inform us at least 2 days prior to departure. Failure to do so may result in additional charges as special arrangements will have to be made. We act as retail agents of our suppliers and in the rare event of a supplier changing the price or terms of a product booked such as ski lessons, ski rental or resort transfers, we cannot be held liable for any price increase or change to the product and you have the option to cancel the item booked free of charge. Unused ski extra items or partially used items such as lift tickets are subject to the refund policy and terms and conditions of the item supplier. Most North American ski resorts allow 'grace days' where you can take a day off so that you do not have to ski all the days on your lift ticket consecutively. Hence the '7 out of 10 days' expression for example that we use on our website. This means that you have a 10 day period from the start date of your ticket to ski 7 days - allowing you the option to take a max. 3 days off during the validity of the ticket. Where excursions or services such as ski lessons are booked through us, you need to ensure that any participants in your party have the necessary fitness, requisite skill level and expertise to take part in any particular activity and to inform the instructor if they do not. For any in resort excursion or acitivty that you book, your contract is with the supplier and we have no liability for these services. The resort transfers featured are based on the licenced shuttle service operated between your arrival airport and resort. These transfers depart on regular intervals during the day and are shared rides - please note they are not private transfers. In most resorts, we can provide private transfers a supplement, please enquire with us for prices. The transfers booked by us are the best times to coincide with your arrival and departure times. If your flight is delayed, the transfer company will usually be able to accommodate you on a later service provided it falls within their schedule. At the beginning and end of the ski season, a more restricted service is sometimes offered which may involve a long wait at the airport for either leg of the journey. Your contract with us is made on the terms of these Booking Conditions under English Law and under the control of English courts alone. The prices featured on our website apply at the time of checking but we reserve the right to change prices from time to time. Prices can go up or down and we will confirm the up-to-date price of your chosen holiday prior to confirming your booking. Once you have booked and paid a deposit, we guarantee that we will not change the price of your holiday. On rare occasions, due to a data inputting error or technical glitch, the website may offer a price for a product that is incorrect. Should this occur we retain the right not to confirm the booking of the product and will respond with the correct price as soon as we are aware of the error. At which stage, you have the option to either confirm the booking at the correct price or obtain a full refund. All party members except for infants under 2 at the date of return travel must pay a minimum deposit of £100 per person for the accommodation and land arrangements made as well as paying either the appropriate deposit or paying in full for any flight booking if required. A booking exists once a Confirmation/ATOL receipt is despatched, detailing what you have booked. Please check it carefully, as items not on your Confirmation/ATOL receipt will not be supplied. You must pay the balance shown on your Confirmation at least 8 weeks before you travel. If we do not receive the amount by this date we reserve the right to treat the booking as cancelled and charge you a cancellation charge as detailed in our scale of cancellation charges. Holiday World Ltd. cannot guarantee that the weather conditions will be suitable for sporting or outdoor activities. Holiday World Ltd. shall not be held responsible for any loss, delays or costs whatsoever connected with adverse weather conditions. The risk of skiing being adversely affected by weather conditions has to be accepted and we obviously cannot guarantee snow. Snow conditions can change dramatically and will not be accepted as a valid reason for you to cancel your holiday. When North American ski resorts open early, they start by only opening a limited amount of the ski terrain and gradually open more runs as demand increases in the weeks prior to Christmas. This is often reflected in the cost of the lift ticket where early season prices are cheaper. Accordingly, if you are looking to ski early season prior to Christmas - please be aware of this fact and that snow conditions may not be reliable and this is why the hotels and accommodations we feature, offer low prices in Early & Late season to reflect this risk. Facilities such as lifts, shuttle bus services, saunas, ice rinks and swimming pools may not be fully operational at the beginning or the end of the season. This may also affect some of the facilities in your accommodation. This may be due to factors such as weather or the number of tourists in resort, repairs or redecoration. These decisions are often made on the spot by their operators and we are not always informed. Early/Late season snow conditions can vary depending on resort altitude. The East Coast resorts are lower in elevation so conditions may not be as reliable as the higher altitude western resorts in the Rockies and California. The best advice is to aim high! It is a requirement of booking that all clients have adequate Travel insurance for North America including Wintersports cover for a ski holiday booking. It is a requirement that all clients advise the name of their insurers and their insurance policy details to Holiday World Ltd. at the time of booking. The lead member of the booking must confirm cancellations in writing by letter, fax or e-mail. To cover the cost of processing your cancellation and to reimburse suppliers, who charge us cancellation fees, we make a charge for cancellations as shown in the grid below. The size of the charge is determined by the date we receive your correspondence. If one member of a party cancels, the proportionate charge of the accommodation & car hire or transfer cost must be borne by the rest of the party. These charges are a percentage of the total cost of your holiday, excluding your insurance premium. The minimum cancellation charge is the loss of deposit. On rare occasions, it may be necessary to change your booked accommodation due to the property being unable to accommodate your reservation - in this instance, we will provide you with the same room type at alternative accommodation which will be of the same standard or higher than what you have originally booked. This is a minor change and no compensation is offered. Compensation or refund payments do not apply to changes, cancellations or curtailment caused by reason of war or threat of war, riots, civil strife, terrorist activity, industrial disputes, natural and nuclear disaster such as volcano eruptions, fire, World Health Organisation or Foreign office advice, adverse weather conditions, closure or congestion of airports or ports, cancellation or changes of schedules by scheduled airlines, industrial disputesand all similar events beyond our control. Problems with transport due to weather conditions, resort closed due to lack of snow. We recommend that you have adequate travel insurance that covers flight cancellation due to weather or industrial disputes. A minimum charge of 15-100% of total cost depending on the cancellation policy of the supplier. This applies only to lift tickets, ski lessons, ski rental or resort transfers and does not apply to any other items booked such as car hire, flights, accommodation etc. which are subject to our standard cancellation charges. Ikon Pass, Ikon Base Pass, Epic Pass, Epic Local Pass, Epic 7-day Pass, Summit Value Pass, Tahoe Value Pass & Tahoe Local Pass are all non-refundable & non-transferable. There is a £20 administration fee per booking (not per person) to amend a Ski Extras order made either online or by phone. For all holiday elements, we will arrange for you the services that make up your holiday as stated on our Confirmation. We have taken reasonable care to make sure that all the services featured on our website are provided by efficient, safe and reputable businesses and that they follow the local, state and national laws and regulations of the country they practice business in. We act as agents of the suppliers we feature and should something go wrong will endeavour to assist you in whatever way we can. Please note that we are not offering a package holiday as such and do not employ local representatives, so you will need to contact our UK office in the first instance if you encounter a problem in resort. You must also report the problem to the supplier of the service that you are complaining about. If your complaint was not sorted out abroad, you must follow it up by writing to us within 28 days of your return. We do not have to look into complaints that exceed the 28-day limit or which you did not report to ourselves and to the supplier while in resort. A complaint, which cannot be resolved, may be referred to an arbitrator appointed by the Chartered institute of Arbitrators. This is an inexpensive and simple way of sorting out complaints and the Arbitration Scheme applies to claims up to £1500 for each person or £7500 for each booking form. You must contact them within 9 months of the end of your holiday and it does not involve physical injury or illness. If you prefer you can take your complaint to the County Court or another suitable court. This section covers injury, illness or death while you are using the services that we have arranged for you. We have no direct control over our suppliers but if they fail to carry out their duties properly, we may make a payment to you, if you suffered death, injury or illness as a result of their proven negligence. We will not make any payment if it was caused by an event or circumstances which that person could not have predicted or avoided even if they had taken all necessary and due care. We will not make any payment if your illness, injury or death was your own fault. If we do make a payment it will be similar to one you would receive under English law in an English court. Our liability will not exceed any limitation applicable under any international convention governing or relating to the provision of service complained about, even if that convention has not been ratified by or applied in the United Kingdom. Should any payment be made to you by us in any if the circumstances referred in this section, we reserve the right to claim in your place, against the party responsible for causing the illness, injury or death and you must agree to assign that part of your rights to us and we will be subrogated to those rights. VISAS & PASSPORTS At press date, British citizens do not require a visa for Canada nor do they require one for the USA provided that they are travelling on a full passport valid until the date of return from holiday for a stay of no more than 90 days. VISA WAIVER PROGRAM - UK passport holders travelling to or via the USA to or from Canada need to apply for a valid ESTA Visa Waiver confirmation min. 72 hours prior to departure, this costs $14pp - please click on the VISA WAIVER link to apply online. This is compulsory and failure to do so will lead to being denied boarding on your flight. If you are travelling to the USA please remember to take a copy of your completed ESTA form to show at check-in. Under Canada's new eTA program, British citizens WILL need to obtain an online authorization before flying to Canada. This new entry requirement is now mandatory. The earlier travellers get their ETA, the sooner they will benefit from knowing they have been pre-screened to enter Canada. A fee of $7 is payable for processing an application for an electronic travel authorization. In the event that clients are refused permission to enter any country due to incorrect documentation, or health precautions, no liability can be accepted by Holiday World Ltd. and no refunds can be made. Details of health requirements can be obtained from the Department of Heath’s website at www.doh.gov.uk. We also recommend you check the latest Foreign Office advice for your destination(s) before departure at www.fco.gov.uk. Where possible, Holiday World Ltd. will pass on any special request to the relevant supplier. (e.g. seat requests, meal requests, adjoining rooms etc) We will always do our best to meet your requirements but no guarantee is given, however as this does not constitute any part of your contract with us we accept no liability if these requests are not met. Some special requests may incur extra charges e.g. a mountain view room, where this is the case the supplementary charge will be added to your confirmation invoice or maybe charged locally. Special meals:- For travellers with special dietary requirements, special meals can normally be requested and must be done so well in advance of the travel date. Holiday World Ltd. accepts no liability for any requested special meals not being available. Please contact our sales department to discuss your requirements prior to making your holiday reservation so we can recommend suitable accommodation and transportation. We will also advise the airlines of any assistance required during your flight. Some flight segments showing one flight number may require a change of aircraft or touchdown en-route. Some flight routings via the USA may also require customs and immigration clearance at the first arrival airport. Codeshare Flights: Due to an increasing number of global airline alliances, it is common place for one airline to operate a service on behalf of another, your itinerary will confirm details of such flights. Many countries impose airport or departure taxes. Where these can be paid in advance, the cost will be included in the ticket price quoted. Other taxes may be payable in cash at the destination. We cannot guarantee the type of beds provided in a hotel room or condominium/apartment, only that the room or unit will be large enough to accommodate the number of passengers booked. We will forward any request to the accommodation supplier but it is as a Special Request only and is not a guarantee. A third or fourth person in a room may have to use a Roll away or camp style bed, as such space may be limited and you may wish to consider booking an additional room. Not all airline tickets sold by Holiday World Ltd. are eligible for mileage/points accrual. We strongly advise that you check with the airline(s) concerned regarding the use of frequent flyer membership(s) before proceeding with your booking. Holiday World Ltd. will not compensate if you are unable to redeem your miles. The contract made between you and us shall be governed by the Laws of England and shall be dealt with in the Courts of England and Wales (or Northern Ireland or Scotland, if relevant). No other courts shall be alllowed to hear these proceedings.